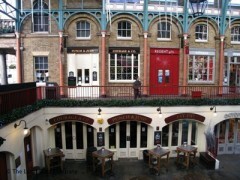 About: Punch & Judy is a very popular pub and as a result can get extremely busy, particularly on a Friday night. It has an upstairs and a downstairs bar that serves traditional English food. They also have a terraced area. A favourite if you are shopping in covenet garden - reeasonable drinks at reasonable prices in the middle of covent garden and near other restaurants for food later, Can be crowded.